Setting up a Blue Bird Trail can be both rewarding and educational. Before setting out and tacking bird houses all over the place, ask yourself if you're ready to make a commitment and monitor your bluebird trail. You'll need to be able to monitor your nest boxes weekly during the nesting season. Take notes of egg numbers, how many hatch and how many fledge. 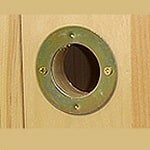 You'll also be watching for problems that may come up during any of the nesting and fledging times. Begin by knowing the Bluebirds habitat. These birds prefer pasturelands, parks, cemeteries, and golf courses. Make sure no pesticides are being used in the area. Avoid heavily wooded areas to avoid competition from House Wrens. House Sparrows will compete with bluebirds for nesting sites. Keep your trail away from farmsteads and feedlots where grain is used since the sparrows will be abundant in these places. When setting up a blue bird trail for the Eastern Bluebird, nestboxes should be placed 100 to 150 yards apart, Western and Mountain Bluebird boxes should be place at least 300 yards apart. Birdhouses should be mounted 4 to 5 feet above ground facing away from prevailing winds. Get The Guide That Tells You All You Need to Know! Most birders set boxes out in pairs, placing two birdhouses 5 to 20 feet apart. The reason for this practice is to allow Tree Swallows to nest alongside of the bluebirds. Tree Swallows will often chase bluebirds away from any nesting site they claim for themselves. Since both species will tolerate each other nesting close by, the provision of two boxes will allow them to nest side by side. Bluebirds nest in late March or early April. In the south nesting may occur earlier. The bluebirds nest is a cup-shaped nest made up of 100% woven grass, pine needles may be used. When the nestlings are about 12 days old, box checks should cease, otherwise they may exit the box too soon. Bluebirds usually raise two broods each season, but three broods are possible. 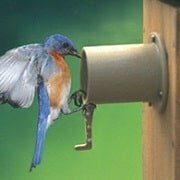 Your responsibility as a bluebird trail landlord is to make every effort to ensure that the nest boxes are constructed, mounted and maintained properly. You may get nesting bluebirds the first year if they are common in your area. 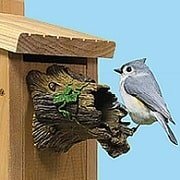 If not, it may take a few seasons for them to find your nesting boxes. Once they find your birdhouse they generally return to the same area each year.